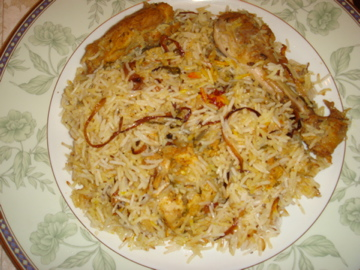 authentic hyderabadi biryani, very elaborate but sinfully tasty. golden fried sliced onions - 1 1/2 cup. choose leg pieces in chicken and wash thouroughly. In a thick bottomed vessel add chicken, pudina paste, curd, coriander and chillie paste, salt, ginger and garlic paste, turmeric powder, chillie powder, oil, slit green chillies. mix well and marinate it for 3-6 hrs. wash basmath rice and boil it in water mixed with garam masala powder, elaichi , salt and shahjeera till 1/2 done and drain water and keep rice aside. Now take a thick bottomed vessel and layer chicken at the bottom, then add basmathi rice and repeat the process. make sure that top layer is rice and bottom layer is chicken. then pour remaining chicken gravy on rice and sprinkle golden fried onions, and saffron soaked in milk, ghee, chopped pudina and coriander. cover vessel with a well fitted lid and seal it with maida, then put a heavy water vessel on the top of lid to avoid burning and cook on low flame for 1hour. Thanks Zehara. It is heartening to know that it turned out well.